Donald Trump’s historic election handed Republicans control of Congress and the White House for the first time in a decade, and after six years of divided government it was assumed a united Republican Party would be able to pass the largely conservative agenda campaigned on by Donald Trump and Republican congressional candidates. 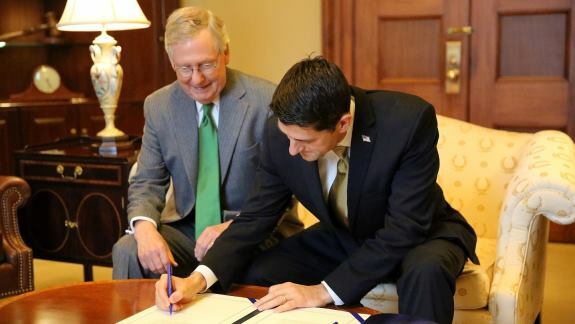 However, despite their firm control of the legislative and executive branches of government Republicans have produced almost zero in terms of legislation that fulfills their campaign promises, leaving it to President Trump to do his best to advance the conservative agenda via Executive Order and Cabinet action. The predictable result is that while President Trump stands around 47 percent in the polls, with his base still strongly approving of his performance – not bad for a President under daily attack by the establishment media. In contrast to President Trump’s approval, Congressional approval stands at 20 percent, less than half of the President’s approval rating, with some 74 percent of Americans disapproving of the job it is doing. A different poll, this one by Pew, found that 54 percent of Americans disapprove of the job the Speaker Ryan is doing. Twenty-nine percent approve while 17 percent had no opinion. More worrisome for the Wisconsinite, said Breitbart’s Warner Todd Huston, is that at 29 percent his approval ratings are lower than most of the previous Speakers including Republican John Boehner (36 percent), Democrat Nancy Pelosi (35 percent), and Republican Newt Gingrich (34 percent). While 51 percent of Republicans approve of the job Ryan is doing, 75 percent of Democrats disapprove. But at 31 percent, the number of Republicans who disapprove of Ryan is higher than the number of Republicans who disapproved of either Boehner (19 percent) or Gingrich (23 percent) as those two leaders retired from the position. And these abysmal numbers for the Republican establishment’s most visible face and loudest voice is beginning to drag down the whole GOP, and especially its establishment candidates. In Tuesday’s Virginia Republican Primary for Governor, establishment Republican candidate Ed Gillespie, the former Republican National Committee Chairman who was narrowly edged out by incumbent Democratic Senator Mark Warner in 2014, barely squeaked by populist firebrand Corey Stewart. Just a few weeks ago, a Washington Post-Schar School of Policy poll showed Gillespie leading Stewart by 25 points, with about a quarter of the GOP primary electorate still undecided. Well, maybe no one except those who attend Virginia Tea Party and other grassroots conservative events. True, Stewart supporters were out everywhere, while Gillespie supporters were nowhere to be found, but the politician who got the most lumps in the political conversation wasn’t Ed Gillespie – it was Paul Ryan and the Republicans in Congress who are perceived as blocking President Trump’s agenda. And the results showed in the Virginia Republican Primary turnout numbers. The two Democratic candidates vying for their party’s nomination for Governor earned nearly 50 percent more votes than the three Republicans who were on the ballot. Looking at these numbers through the lens of the 2016 presidential election this spells disaster for Republicans, claims Bump. During the 2016 campaign, a lot was made of the gap in enthusiasm shown in primaries between Democrats and Republicans. The Trump campaign insisted the higher number of Republican primary voters would translate into a victory in November – and it did in some key states. Bump says there was a correlation between the number of votes cast for each party in the primary and the votes each party earned in a state in the general. This makes sense, of course; states with more Republicans than Democrats (or vice versa) will see more votes cast for that party in both cases. There were eight states, though, in which there was a difference between which party earned more votes in the primary and the general. Bump points out Trump won four of them; Hillary Clinton won the other four. There was a cluster of four states where more Republicans voted during the primaries than Democrats and three of them were key: Wisconsin, Michigan and Pennsylvania. None of those were states that Trump was expected to win going into Election Day noted Philip Bump, however, as it turned out, the Republicans earned more votes in both the primaries and on election night. They ended up being critical swing states, states responsible for Trump’s victory. Despite what the establishment Republican bundlers and their TV admen and buyers want you to believe, enthusiasm and ideological commitment matter in elections. Donald Trump had an agenda that turned out the most voters in Republican primaries, and in the key swing states in the General Election, but right now (and for a long time) the Republican establishment has no agenda, and quite logically it follows that there’s no enthusiasm for its candidates. If Ed Gillespie, and Republican candidates in other states want to win in 2017 and 2018 our advice to them is to do something to build grassroots enthusiasm behind their candidacies, and one easy thing they could is embrace and fight for the America First agenda that propelled Donald Trump into the White House.